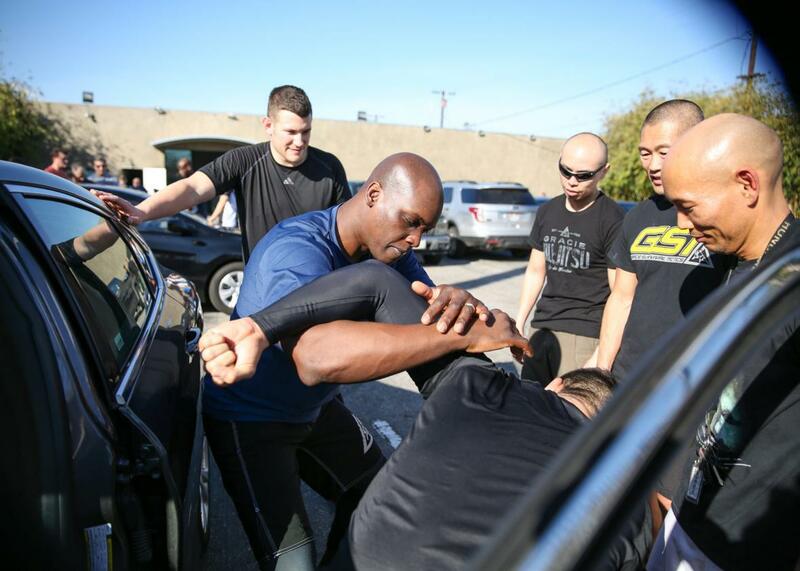 Can mixed martial arts training make police less dangerous? Rener Gracie demonstrates the power of joint manipulation and leverage in a conflict situation. Rener Gracie beamed with pride as he showed me a video on his phone. The footage, taken from a surveillance camera at an apparel store, showed one of his students, a police officer, threatening to break another man’s arm. The officer claimed he’d seen the man pocket a pair of expensive sunglasses. As the man attempted to leave the store, the officer intervened and, after a short struggle, they wound up going to the ground. With calm precision, the officer trapped the suspect in an armbar and waited for backup to arrive. “He held that position for over a minute,” Gracie told me, pointing out how his student torqued the other man’s elbow joint backward against his hips, hyperextending it just enough to stop the suspect from struggling but not so much that the tendons and muscle tissue holding the joint together tore away from the bone. Gracie teaches moves like this one, adapted from the “gentle art” of Brazilian jiujitsu, to officers who pay $995 for a five-day Gracie Survival Tactics seminar. The idea is to train law enforcement officials to handle resistance using martial arts techniques that at once protect civilians from excessive uses of force and help officers fight off unforeseen threats. Officers who take Gracie’s class, the sales pitch goes, won’t panic at the first sign of conflict and will be less likely to pull their guns. As a consequence, they won’t make the kinds of mistakes that cost people their lives. I watched that surveillance video during the fourth day of one of Rener’s seminars, a training held in at a gym nestled between a Dairy Queen and a community arts center in Virginia Beach, Virginia. In the locker room in the back of that gym, a framed poster showed a timeline of Brazilian jiujitsu, tracing its development over the last 100 years. It was popularized by Rener’s grandfather Hélio Gracie and brought to the United States in the 1970s by Rener’s father Rorion, who settled in Southern California and supported himself working as a housecleaner, construction worker, and stunt coordinator until he’d hustled up enough money to open a gym. In the years since, Gracie-certified jiujitsu gyms have opened all over the world, with outlets everywhere from Minot, North Dakota, to Makati City, Philippines. The family-run business has also expanded to offer specialized programs for kids dealing with bullies and women’s self-defense, in addition to selling training books, DVDs, Gracie-branded apparel, and even juicers. More than 50 students had come to Virginia Beach to study with Rener Gracie, and they were joined by a handful who’d traveled from Germany and Denmark. Students who complete the seminar will be certified as Gracie Survival Tactics instructors in their own right, ready to train their fellow officers back home. “We’re trying to teach people how to fight so they don’t have to,” Allan Manganello, an officer with the Louisville Police Department who also works as an assistant trainer for GST seminars, told me during a lunch break. The Gracies don’t have this niche all to themselves. Greg Jackson of the famed JacksonWink gym in Albuquerque, New Mexico, home of UFC stars Jon Jones and Holly Holm, consults with local law enforcement and developed a training curriculum that’s been used by police. Brazilian jiujitsu guru Ricardo Almeida has taught combat training to the New Jersey State Police as well as on Army, Air Force, and Marine bases. Former UFC lightweight champion Pat Miletich, proprietor of the now-defunct MMA gym Miletich Fighting Systems in Iowa, taught law enforcement seminars on the side for years before co-founding a new company, Fire Horse Combatives, that offers in-service trainings for officers and police academies. Some studies have found evidence linking long-term study of a martial art with lower levels of aggression. At the same time, a short jiujitsu seminar could teach aspiring martial artists just enough to be dangerous. For someone who’s just beginning to learn jiujitsu, it would take one to two years to graduate from a white belt to blue belt. Meanwhile, a simple chokehold, or lateral vascular neck restraint, is difficult to master but fairly easy to learn. One of the early proponents of the chokehold in policing was Korean War veteran and third-degree judo black belt Jim Lindell, who worked as a police trainer with the Kansas City Police Department in the 1970s. The technique, a choke that’s meant to cut off blood flowing to the brain through the carotid arteries on either side of the neck, has many variations in jiujitsu, combat sambo, judo, and catch wrestling. The consequences of misapplying a chokehold can be catastrophic. In June, a police officer in Las Vegas was charged with involuntary manslaughter after applying a neck restraint to a 40-year-old man for more than a minute. The coroner determined the cause of death was “asphyxia due to police restraint.” In 2016, a man was killed in an Oklahoma jail after a corrections officer held him in a chokehold for more than a minute, crushing his windpipe and causing him to asphyxiate. In 2013, a 60-year-old Michigan man who was suffering from a diabetic episode alleged his windpipe was crushed and vocal cords fractured after an officer place him in a chokehold. And in 2014, Eric Garner was killed when Daniel Pantaleo, an officer with the New York Police Department, used a neck restraint to drag him to the ground for handcuffing. The coroner ruled the death a homicide and listed the cause as “compression of neck (choke hold), compression of chest and prone positioning during physical restraint by police.” In spite of that finding, a Staten Island grand jury declined to indict Pantaleo after hearing his private testimony, during which he claimed he’d feared for his safety and had never intended to hurt Garner. Like chokes, arm and wristlocks—standard techniques in judo, jiujitsu, and aikido—are relatively simple to learn but incredibly easy to take too far. In 2014, a part-time Texas officer broke a high school student’s arm after holding him in a wristlock while trying to break up a fight. In 2015, a Kentucky police officer broke a woman’s arm via wristlock as he was attempting to handcuff her in front of her home. Manganello told me he once applied an armbar on a suspect who, he would later learn, was high on cocaine. The man kept fighting despite the pain, Manganello said, and he broke his arm. He then moved to the man’s other arm and dislocated the suspect’s shoulder, at which point he became compliant. It’s hard to measure how many of these incidents are the result of inadequate training versus training playing out exactly as intended. Most departments maintain notoriously unreliable records on use-of-force incidents, and there’s little consistency in record-keeping from department to department. I asked Charlie Fernandez, a police trainer who helps coordinate GST seminars, whether he knew of any cases in which GST-trained students caused injuries to suspects in the field. He said it was “certainly possible” but that he didn’t know of any cases offhand and that departments didn’t provide them with any data about injuries. Some departments rely on larger oversight bodies, like Peace Officer Standards and Training, to set minimum educational requirements for law enforcement officials. Others fall under the purview of the Commission on Law Enforcement Standards and Training, which the Gracie Academy worked with to have its training approved in Michigan. In all, the gym has had its curriculum reviewed and approved by hundreds of federal, state, and local law enforcement groups. After getting feedback from officers, the Gracies incorporated a number of tactics for removing combative suspects from cars. The Gracies have also had their GST program reviewed by a law firm to certify it complies with the principles for reasonable use of force established by Graham v. Connor, the 1989 Supreme Court decision that established the criteria for evaluating the “reasonableness” of an officer’s use of force. On account of this ruling, a technique that’s prohibited by department or state policy may still be legal for an officer to use it if it’s seen as a “reasonable” response “in circumstances that are tense, uncertain, and rapidly evolving.” This helps explain why, for instance, after NYPD Commissioner Ray Kelly banned chokeholds in 1993 complaints about their use rose steadily in the years following without any corresponding rise in criminal prosecutions against offending officers. The procedure doesn’t look like much when Gracie performs it on one of his assistants. He uses his hand to slightly lift the shoulder of his partner—the theoretical 100-pound protester is played by a 180-pound man—which creates space for him to slide his knee under the assistant’s elbow. Gracie uses his knee to lift that elbow out and away from the torso like a bird wing, then grabs his assistant’s exposed wrist and slides his arm behind his back. From there, he slowly twists his wrist while commanding the assistant to give him his other hand. Later, he demonstrates the move on me, and it feels like magic, as if my body’s being solved like a Rubik’s cube. For the last step, he introduces a variation by placing me in a finger lock, gradually twisting my index finger out and away from the palm of my hand. It’s stunning how immediately the pain arrives—suspended at the dividing line between discomfort and damage. Martial-arts training programs certainly focus more on protecting officers from worst-case scenarios than shielding civilians from excessive use of force. While policing is traditionally considered a dangerous job, the numbers don’t completely support that assumption. A 2014 FBI report found the murder rate for police officers was around 5.6 per 100,000, only slightly higher than the rate of 4.5 per 100,000 for the general population. (You’re more likely to die on the job as a trucker or roofer than you are as a police officer.) The same FBI report found there were 48,315 assaults on officers in 2014, the second-lowest number since 1996 and part of a steady annual decrease since 2007. Of those assaults, only 4 percent involved a suspect with a firearm, and 2 percent involved a suspect with a blade. Another common fear, that officers might have their weapons taken and used against them, seems dramatically overstated. A 2011 FBI survey found that of more than 900,000 sworn law enforcement officers, only three were feloniously killed by their own weapons in the line of duty. Modern martial arts was founded on the principals of self-defense—the weak protecting themselves against the powerful, the bullied discovering the tools to fight off the bully. Leaving the gym in Virginia Beach, I thought about a quote from Hélio Gracie that I’d seen on that poster in the locker room: “Our jiujitsu represents the triumph of human intelligence over brute strength.” After watching a day of training, it wasn’t clear to me whether the seminar aligned the police more with human intelligence or brute strength. Of all the drills I’d seen, none had focused on how to distinguish an aggressive gesture from a symptom of diabetic shock, or how to separate a suspect’s fear of arrest from a desire to harm an officer. In many ways, the techniques seemed designed to make those distinctions immaterial. If given a choice, most people would probably prefer being caught in a chokehold that temporarily causes you to lose consciousness as opposed to getting clubbed with a baton. But both are violent acts, and neither feels like an ideal way to address the kinds of conflicts that officers encounter on a daily basis.